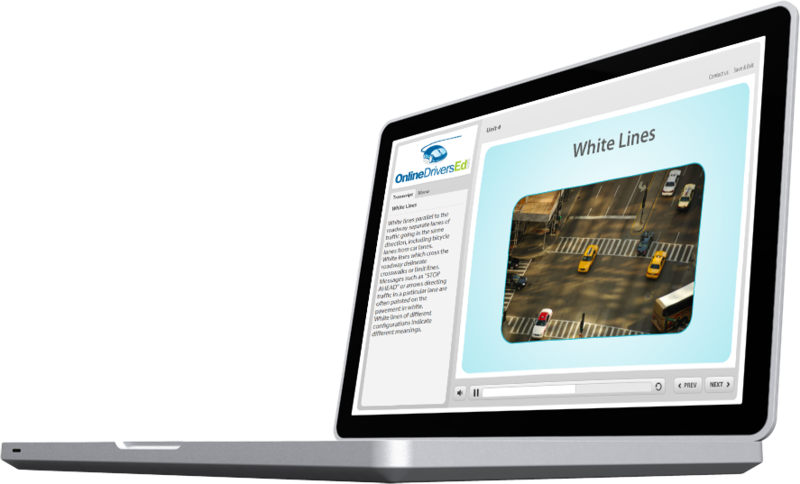 This is a self-paced drivers education course delivered in an online format with text, interactive flash animations, and video. This slideshow course is divided into 12 units. Each unit has text, graphics, interactive animations, and videos, along with complete audio narration. At the end of each unit is a review quiz. Each quiz has 10 multiple choice questions. These quizzes will help you prepare for the final exam. The final exam consists of 100 multiple choice questions, from all of the topics covered in the course. You may retake the final exam as many times as you need to until you achieve a passing score of 80% or better. Explain the state driver licensing requirements. Explain the effects of driving while impaired, or distracted. Differentiate among the various regulatory signs, warning signs, information signs and pavement markings. Analyze vehicle operations, performance, and maintenance. Explain defensive driving techniques used to avoid accidents. Explain safe practices while driving in high traffic areas. Explain driving requirements when sharing the road with others. Basic understanding of California vehicle code.